Hidden Jewel in the hills of Villa Park. Behind a long, gated driveway lined with colorful flowers, you are welcomed to this extremely quiet, private, resort-like home with many HARD-TO-FIND features. HUGE foyers designed for large family gatherings. Open floorplan allows one to see through the house filled with nature light, courtesy of numerous windows. Magnificent dual spiral staircase and soaring 10' vaulted ceilings on BOTH floors. Retreat and relax in the first-floor Master Suite with a fireplace and steam shower. The kitchen has top of the line appliances. Separate cooking area with sink for large-scale cooking without the lingering odor. In the 4 upstairs bedrooms, you will wake up with the morning sunshine and a green wooded view. State-of-the-art theater room designed for movies & classical music without the caveman feeling. Laundry rooms on BOTH floors. 6 fireplaces to warm and enchant your family and guests. Cook your favorite dishes with the outdoor built-in BBQ, while your guests lounge at one of the patios, view decks or poolside, listening to the sound of the waterfalls. A game of basketball or badminton on the sports court is a hit for all ages. From just about anywhere, enjoy beautiful peaceful views of the surrounding hills (with no unsightly utility lines). Huge balcony (not bedrooms) above garage, so no disturbance when garage doors operate. Perfect for large indoor and outdoor events for generations. Room for ADU, boat, RV, etc.. Truly a rare home. Lot Size: 0.7 Acres / 30492 Sq. Ft. Directions:From Cannon St, turn onto Loma Street. Go straight at stop sign, road turns into Mesa Drive. SchoolsClick map icons below to view information for schools near 19125 Mesa Drive Villa Park, CA 92861. 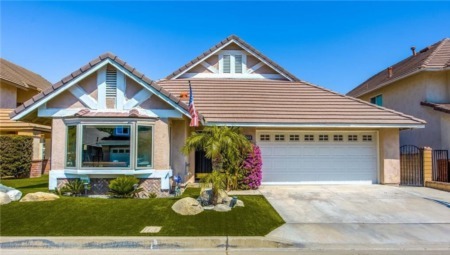 Listing provided courtesy of Dexter Stanley, Bhhs Ca Properties.